Description: Series 156: 95. Degas in the Bordello (Bloch 1950, Baer 1959). Original etching, 1971. This is one of 50 numbered impressions signed with the estate signature stamp. 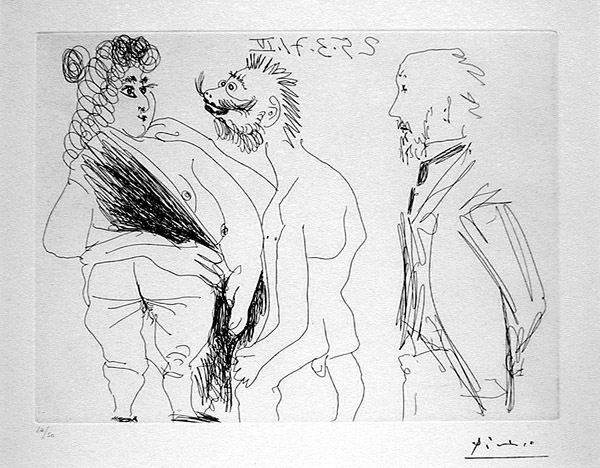 Executed 3/25/71 and approved by Picasso before his death. This etching, like the others in this series, was printed posthumously. Here Degas watches a patron of a bordello with one of the objects of his lust. Note the brutishness of the male customer in the brothel oblivious to the quiet and observant artist. Image size: 230x310mm.